An eclectic mix of local and out of town talent will be reading at the Bluewater reading series on Saturday, April 11th, in celebration of National Poetry Month. 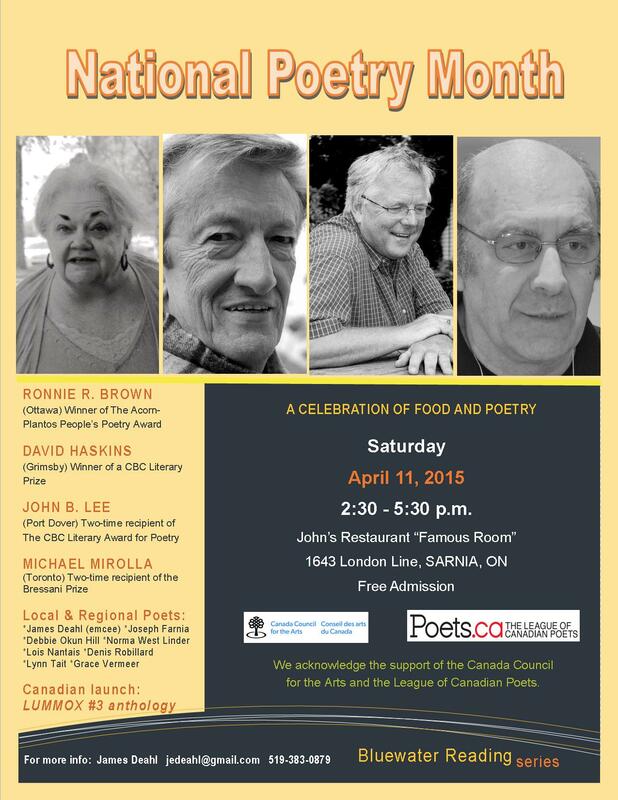 The event will take place at 2:30 PM in the Famous Room of John’s Restaurant (1643 London Line in Sarnia, Ontario). Twelve Canadian poets will be reading their work from the LUMMOX#3 Poetry Anthology, which will be launched on the same day, including Michael Mirolla, two-time recipient of the Bressani Prize, and Editor-in-Chief of Guernica Editions; and James Deahl, author of Rooms the Wind Makes which was published by Guernica Editions in 2012.
and local and regional poets: Joseph A. Farnia, Debbie Okun Hill, Norma West Linder, Lois Nantais, Denis Robillard, Lynn Tait and Grace Vermeer. Admission to the Blue Reading Series celebration is free and all are invited to come discover the fabulous mix of literary voices that will be present at the reading. Tagged with anthology, Bluewater Reading Series, James Deahl, Lummox # 3, Michael Mirolla, Poetry Month, reading.